Strawberry Nutrition Facts bring good news to all strawberry fans! If you didn't already love your favorite berries for their delicious taste, you would start eating them for their nutrition and health benefits. 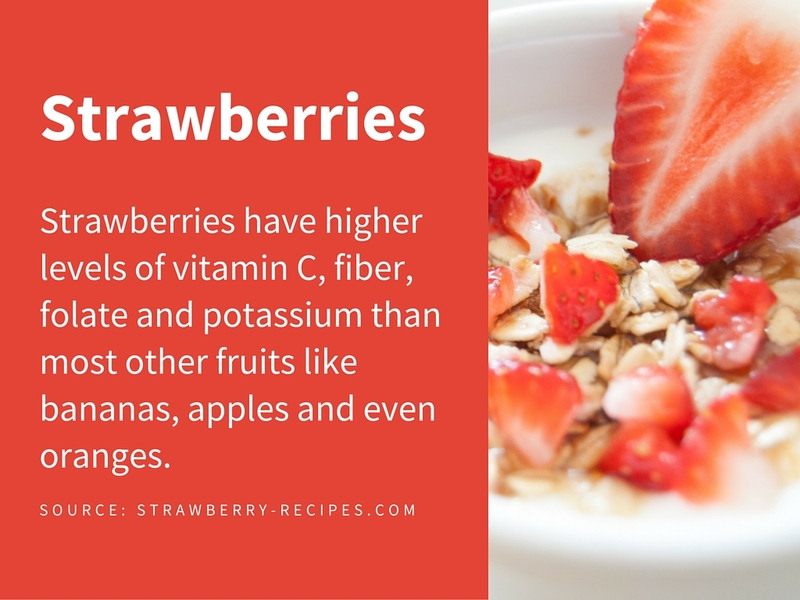 Strawberries have higher levels of vitamin C, fiber, folate and potassium than most other fruits like bananas, apples and even oranges. Apart from the obvious health benefits, a study by Dr. Gene Spiller, Nutrition and Health Research Center, has shown that eating one serving (about 8-10 strawberries) a day can significantly decrease blood pressure, which may reduce the risk of heart disease. Other studies showed additional nutrition benefits: Strawberries are found to reduce risk of cancer, enhance memory function and rheumatoid arthritis. Even though they're so sweet, strawberries are naturally low in sugar. This makes them a perfect snack or dessert. Indulge without feeling guilty. Even better, the antioxidants phytonutrients help you to maintain your health and look younger. This is why strawberry skin care has become increasingly popular in the last years. The California Strawberry Commission has funded more than $1.8 million to research strawberry nutrition facts in the last 10 years.